You might say I have a bit of a temper. Well, you might say this if you lived in my household or witnessed me with my kids and my husband. I have what is called a “short fuse” or, more accurately, a hidden short fuse because my having a temper isn’t something most people would attribute to me, though I regularly say that patience is not a virtue I was given. Usually I am fairly amicable, easy-going and (I think) pleasant to be around but it seems that if you live with me, you get the short end of the stick. I’m not sure if being agreeable elsewhere means I don’t have enough patience for the people I come home to or if it’s just normal that you have the least amount of patience for those you know best and trust most to see you at your worst. Probably some of both. And probably something we all can relate to in some way – our families don’t always get our best selves. Either way, I still have a temper and it’s not really my most winning feature. 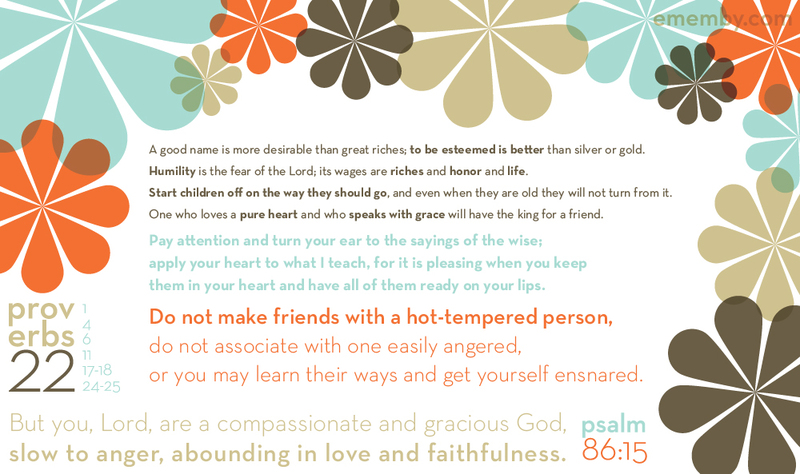 I was looking for verses to post here and I came across Proverbs 22 which is full of wise sayings (some of my favorites are the smaller type – click on the image to embiggen) but the one that jumped out at me is: do not make friends with a hot-tempered person. Ahem. Oh that. And what was that a few verses earlier about starting children off on the way they should go? Perhaps by setting a better example? My children are also a little short-tempered (and strong-willed, but that’s for another post)… something they were in part born with but also I think something they’ve learned over time as a conditioned response to their family when they are frustrated by some or all of the other members (Simon also has a temper – our children were bound to carry on tradition). I’ve also seen the boys’ tempers manifested when they are at daycare (hello, Jack and his biting habits this summer) and with friends (at a play date just today) and this is not something I want to see continue. It is not okay with me and they need to figure out other ways to deal with their frustrations, but first, I have to figure out other ways to deal with my frustrations. I need to follow the example of my Father, highlighted many times in the Bible, “[He is] slow to anger, abounding in love and faithfulness.” When I start following His example, I can only hope that my kids will turn and follow mine and then we can all make better friends (and parents). 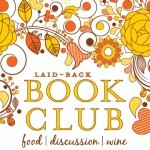 I need to add Unglued to my to-read list! Nothing like a little biblical reminder to steer you in the right direction – hopefully we can get a handle on this… or at least know we are not alone! Okay, I just replied to your comment on my post that we need to meet. Now I read this, and it’s like you are describing me. Wow. Big love and blessings and hugs to you. Aww… agreed! How to make that happen is another story… but someday! Thank you for your encouragement – we’ll all get there eventually because we already know where we need to be, right? You are certainly not alone….right there with you. So glad we are in it together! UGH…how many times have I heard my daughter lose it with her siblings and am paralyzed in my tracks because she sounds JUST LIKE ME. I hate this. I’ve been working on finding WHY things push my buttons, what other feelings are under there. I read a book on Anger by Gary Chapman called, “The Other Side of Love” convicting and yet hopeful. I tell Ava all the time, “I don’t want you to fix this so you can be like me. I want you to fix this so you won’t. I want you to learn to deal with your response to anger (cuz we talk about how anger itself isn’t a sin but screaming at others is) at 7 so that when you are 37 like Mama, you aren’t STILL dealing with it.” I raise a glass to becoming less hot tempered and more like Jesus…Please, God! The calm parenting class I took through church talked about stopping the cycle, realizing what it was about the situation that pushed your buttons and being aware of it so you could head it off at the pass before your lost your temper. At least we are aware of it and trying to make the change. We just have to keep praying through it every day… I am going to check that book out.